The King of Rock and Roll is alive and well, according to local psychiatrist Don Hinton. Hinton, who works at Independence Regional Health Center, says he has been treating Elvis Presley for the past five years. Hinton is earnest but recognizes there will be skeptics and critics. “There are people who wouldn’t accept it no matter what I would say or do unless he were here eye-to-eye, and then they would want a blood test or DNA test,” Hinton said. Becoming Elvis’ physician is no easy task. Hinton was a member of group of people who knew of Elvis’ existence for more than five years before he was finally able to speak to the King over the telephone. According to the book, Elvis staged his death in 1977 and assumed the identity of his twin brother Jesse who was born dead. 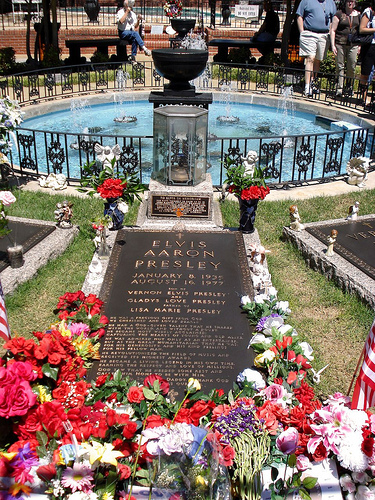 Elvis, who became famous for songs like “Love Me Tender” and “Hound Dog,” and movies like “Jailhouse Rock” and “Viva Las Vegas,” died on Aug. 16, 1977, from an drug overdose. But now, Hinton says, Jesse, nee Elvis, is ready to reclaim the limelight. And the book is just the beginning. But Hinton is certainly not alone. Also among the inner circle of Elvis confidants is Linda Johnson, a neighbor and former co-worker of Hinton’s. The Elvis book was not released by a major publishing house, Johnson said, because the King wanted to keep his book affordable for fans. Larger publishers wouldn’t have accepted the work unless they saw the author typing it. Today, Hinton and Johnson said, Elvis is a changed man. One thing important to Elvis, er Jesse, these days is privacy. Hinton even kept it a secret from his wife, Heather, when they were dating. Heather Hinton admitted she was skeptical at first. Color Heather Hinton among the believers. Don Hinton broke the news to his co-workers shortly before the book came out. He said the news hasn’t hurt his practice. Hinton’s co-workers at Independence Regional Health Center declined to be interviewed. Could there be any connection? Thanks for reading. You certainly know your family tree better than me. I covered this story a long time ago and if my memory is correct, Dr. Hinton and I never met face-to-face. All my interviews with him were conducted over the phone. He never mentioned an impersonator in the family and as I recall wasn’t even an Elvis fan prior to “treating” the King. If you want to dig deeper and learn more, Dr. Hinton’s book is for sale here. Readers may be interested to know that the Don Hinton who commented above was one of the first Elvis impersonators. He was impersonating Elvis while the King was still alive (or, ahem, at least publicly performing). Mr. Hinton’s Myspace page contains a great bio, photos and history of Elvis impersonation. It’s definitely worth a visit. Thank you for reading and taking the time to write in, Mr. Hinton. It was truly a pleasure to hear from you. Oh my, Don is actually answering his own response. I”t was 2004 Dr. Don introduced me personally to JESSE. Trust me… if you were me,on that afternoon you would have a great deal of respect for Dr. Don, Linda, Jesse-Elvis. I know the truth and understand why someone would choose to go this path! Priscilla, Lisa Marie, there is no way you cant know!! Hello Brian – it’s a while back since your last post, and you may not be on this site. But is there anything else you could say to us, be willing to say, about that afternoon? I’m sure you know how much it would be valued. Warm wishes from the UK. maybe that’s why Priscilla never married. and Lisa Marie is out of the lime light. Thanks for reading, Lisa. It will be interesting to see what time reveals. I hope Jesse enjoyed his 75th birthday. We all need to clear up one thing the man Don Hinton that you are showing is not the doctor that wrote the book “The truth About Elvis Aron Presley. Don Hinton is a Board certified psyciatrist here in Missouri! Not a former impersonator!” read the book the doctors photo is even on the back cover of the book!” I repeat I have accually met Elvis/Jesse in person and hold a great amount of respect for him as a regular normal person that goes for the doctor ! Jesse deserved a chance to have a quiet life and hope it stays that way till he chooses otherwise!! I am not selling him out ,just wanted to set the story strait! I hope Jesse enjoys his seclusion in peace,and all non believers,who chose to nulify all factual evidence, EVIDENCE AND 100% PROOF that Jesse is/was Elvis. Its hard trying to tell people that Elvis is alive,afterall,Jesse is alive,Elvis is dead. We know the truth,thats good enough for me. .. apologies .. that is Jon Cotner to be correct .. B.
is the book released in Ausralia. somehow even to me the story seems real. i did go to hawaii recently with my wife and even went to Lanikai beach were elvis used to hang out. I could swear i saw a older male with white hair just like the Jesse photo from Dr hintons book. by the time we bult up nerve to walk up to him and say hello, he got and left with 2 males and a female. very strange. long live elvis/jesse god bless him. I haven’t read the book, but i have read the letters that are online on linda hood sigmons website, i did believe Elvis was alive up to a point until i read the part where jesse says that his daddy did not know he faked his death ! I just cannot believe Elvis would fake his own death and not let his daddy in on it! how cruel would that be to put his own dad through something like that? And to think he would just up and dissappear leaving his daddy and his grandma as old as they were and not ever see them again, i just cannot see that, and what about when they both died, if he is still alive , did he not risk coming to their own funerals??? See what i am talking about? Elvis would not do this i don’t believe! there’s just too much here to believe he faked his death! and does anyone know if this Linda has ever even seen this Jesse person in real life? Or has she just talked to him over the phone and in letters as she states? i have never read where she has seen him in person. has anyone here? if so please tell me where i can find that. Jesse, If you are who I think you are, we need to talk. I am former U.S. Secret Service and protected Presidents Ford and Carter at the White House. (1974-1977 10-30-77) We have many things in common, and I have over 25 tears law enforcement experience that tells me you may need some help? I am a fan of yours, but more along the side of law enforcement. I also worked in narcotics and U.S. Customs to name a few and WE are both life time members of CNOA, and other organizations, I lived in Japan and studied martial arts since I was 15 and obtained my black belt in Judo.I was also tested at the Kodokan in Tokyo. I met a lady named Anne Margaret when she was at Camp Zama where I was at school and she was there for a USO show with Bob Hope. (1969-70)I was 21 years of age when I was in the USSS and stationed in Washington D.C. FMD/WHD I know about the famous visits you had made when you saw Nixon, and later Carter in 1977. I also got many certificates with the various agencies when I later went into U.S. Customs, SDPD, etc… I also have a DEA certificate as well. (After it was BNDD)I used to hear other “agents” tell me about your visit and the special “gift” you gave Nixon. Not many people know about that. I am also a badge collector and I know an expert who is also former U.S. Treasury and has actual copies of your credential. I also studied religious relics and the Shroud of Turin and ALL related subjects as well. Anyway, long story short, I am convinced of your leaving to protect yourself and others. What you did was the right thing. Even though lot’s of people have suffered over their loss regarding you. I am one of the best there is in my field of work and I have very special expertise and experience in identifying people as I did while in U.S. Customs. if jesse is elvis dont you think its gone to far now be a man and good person and come out anyway you can for ur fans. dave. All Elvis fans wish he were still alive. Sadly, I’m quite certain this is not the case. Elvis would never had done something as mean to his fans, or as cowardly, as fake his own death. Never under any circumstances! I understand why people want to believe, but come on now! Do you REALLY believe Elvis could have done something like this? Elvis was so famous and still is. When you are that famous I’m sure it would become totally exhaunting for anyone. loved him,that is ever since I was 5 yrs of old. Even if he’s alive I still have Great respect for him. Biggest load of BS I have ever heard, I also question your credentials as a DR. You are just an opportunist hoping to make money off Elvis. Crawl back under your rock and stop trying to influence stupid people. Elvis Aaron Presley died on August 16 1977 Let him rest in peace and you should find a different hobby or do you do this because it is your only source of income Dr ??? By the way Craig what is this 100% truth, show it to me. Oh by the way did you know that JFK is still alive in a nursing home !!! how disgusting that people would stoop so low as to make money out of of a person as generous,and selfless as elvis,,beware,your ill-begotten gains just might come back and bite you,-thank you ,elvis,for all the pleasure you gave me and my family,and are still giving us,i have most of the music you ever did,—-REST IN PEACE,MY FRIEND,x,. Ignorance is bliss they say. face it…Elvis is dead. I see my other email was not posted, what is the matter, this only increases my belief that you are a liar. I love Priscilla’s comment in fact you have screened emails so only ones that support your crap are printed. Sounds rather like a coward !!!!!! it sounds makes sense, but wouldn’t Elvis get in a lot of trouble if he did come back? He faked his own death! If he is alive, I wish he would come back. Hey Doc did you get your license to practice from Acme Let Wylie the coyote know I enjoy his Cartoons and would like to meet him !! Oh my God Dave are you serious ! I had no idea that a ” True ” Elvis fan could be that stupid. Way to go Gord Knight you tell it like it is. Hey Doc when the fans viewed Elvis in his coffin was that a (Stand In) ? I hate Morons like you !!! Oh my God Dave are you serious ! I had no idea that a ” True ” Elvis fan could be that stupid. Way to go Gord Knight you tell it like it is. Hey Doc when the fans viewed Elvis in his coffin was that a (Stand In) ? I hate Morons like you !!! By the way Doc It has now been 36 years is he held up in Traffic ? to be interrigated, Just take it as it comes. This is a total interesting story that has the world in a spin, cant believe how expensive this book is to buy??. is it cause its true..
where do you purchase this book? The extra “A” story is false. It’s actually on his birth certificate as Aaron. He used Aron for a long time and wanted to change it to “Aaron” later in life, the biblical version, and found he didn’t have to as it was “Aaron” on the birth certificate. I was a patient of Dr. Hinton’s for a few years in Independence, Missouri, at Jackson County Psychiatric Association. I was treated there for anxiety. Even tho it is hard for many people to believe Dr. Hinton’s story, I have to say Dr. Hinton is a very credible man of sound mind. Probably one of the most caring and honest doctors I have ever met. I’ve read his book, and as I previously stated, even tho this may be hard for people to accept, one must consider the risk of ridicule Dr. Hinton would accept facing in his career and personal life by coming forward to tell the story as Elvis choose to do. I’m sure for his efforts his financial needs have been forever taken care of. Elvis is alive, take it or leave it.